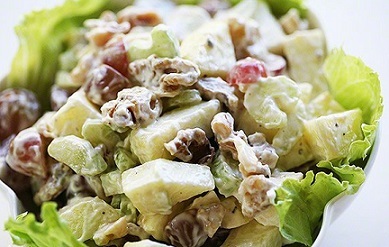 The Waldorf Salad Recipe was originally from the Waldorf-Astoria Hotel in New York City. And the original version did not have walnuts. 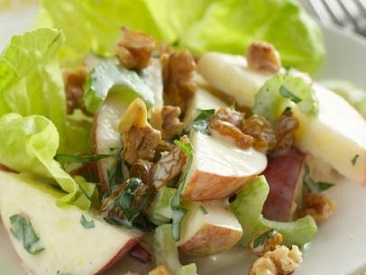 This restaurant salad recipe does because that's the way my customers prefer it. For over two decades my small town American-style family restaurant has "tested" thousands of recipes with customers (guests). I kept only the recipes that overwhelmingly won their approval. The recipes on the website have been "tested" (tasted) and approved by restaurant customers. They are all real restaurant recipes and favorite restaurant recipes. Preparation time: about 25 minutes. Salad recipe serves 8-10. 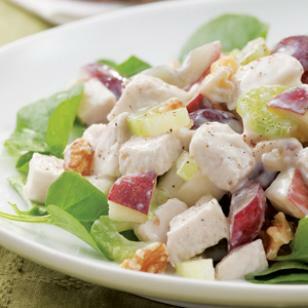 A long- time favorite restaurant salad recipe! Enjoy your Restaurant Salad and the company of those you share it with!